2 bedrooms, 2 baths, Sleeps 2-4. The Hummingbird, on the Caribbean Sea, offers quiet and privacy on a long stretch of beach. Beyond the spacious seaside terrace is the clear, turquoise blue water of the Caribbean Sea's Balara Bay. The Hummingbird is ON THE BEACH. Take our private driveway from the Queen's Highway to a breathtaking setting. The home is surrounded with gardens filled with bougainvillea, hibiscus, and numerous other tropical flowers and plants. The HUMMINGBIRD's charm and character include a Savannah stone exterior, terraces, an acre of private grounds and tropical gardens, and a beach with a large Tiki Dome for seaside shade and comfort. Our beach is calm, shallow and safe for water play. Tropical foliage surrounds the home and property inviting peace and serenity and quiet. All rooms have seaviews. The spacious private master bedroom is situated in a small wing of its own. The bedroom has AC, ceiling fan, and TV and en suite bathroom. The guest bedroom has two twin beds and a king conversion kit. It also has an en suite bath with a large, walk-in shower. The front room features couch, loveseat, two upholstered chairs. A sunroom with wide window expanse, adjoins the front room providing additional comfortable seating for quiet relaxation. The well-equipped kitchen includes a breakfast bar and table seating with 8 feet of window-views to the sea. Sliding glass doors, and cathedral ceilings give the home an open, tropical atmosphere. The interior is comfortable and inviting with rattan furniture and original works of local artists. Hummingbird's Balara Bay Beachfront has a stretch of beach that border the Caribbean Sea. You can walk all the way to the old docks at the far end of Balara Bay. Kayaks are available for water excursions on Balara Bay and across to Levy Island. Balara Bay offers our guests bonefishing as well as shelling. Our gardens surround the home and attract mockingbirds and hummingbirds. Hummingbird's Balara Bay beachfront is premier Caribbean property. We have a small, 1250 square foot home, on beautiful waterfront that warrants a 'manor' house. The home is private, unpretentious, comfortable, and inviting on an extraordinary piece of Caribbean beachfront. Come visit us. Our guests return. Hummingbird's Floor Plan/Special Features: The master bedroom wing is as close to the Caribbean as you can get! A pleasure to watch / listen to the varying moods, colors, sounds of the sea. The guest bedroom is across the house. This arrangement of rooms with the 'living area' in between, offers welcome privacy, even when two couples share the home, or when a family brings children. The sun room, front room, kitchen and breakfast room separate the two bedroom areas. In addition to the Caribbean sea breezes, the house has a wonderful air-flow pattern with its many windows and doors. Ceiling fans are throughout the home. The home and location offer a wide diversity of activities. For the sports enthusiast, swim, jog, fish, scuba, snorkel. For the relaxer, sunbathe or locate a good book. Something for everyone. Gil and Marian Macy purchased this property in 2000. As a retired couple, we spend one half of each year on Eleuthera. The Stone Beach House was our first home. In 2010 we built The Mockingbird on our adjacent property. For the first time in 10 years, the Stone Beach Cottage is available for year-round rental. 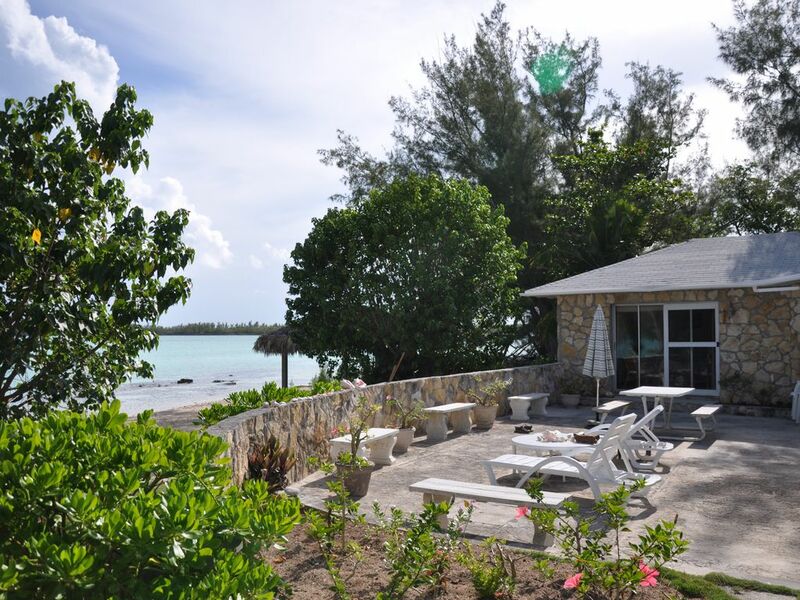 It is a home of charm and character, is well maintained and well equipped... a true island retreat! Location. Location. Location. Balara Bay offers hundreds of feet of white sand Caribbean beach. Gently prevailing winds and crystal clear water. The beach is sheltered by Levy Island providing excellent swimming, kayaking, boating, and paddle boarding. We love the proximity to Governor's Harbour the island's largest settlement with restaurants, music, entertainment, grocery stores, banks, gift shops, and churches. A center island location provides convenient travel to North or South Eleuthera. We wanted a Caribbean beach away from pounding seas and winds on Atlantic side. We wanted ON THE BEACH. Balara Bay's white sand beach just off our terrace and the Caribbean Sea is 80 feet away. Great location for kayaking, stand-up paddleboarding, swimming. Snorkel on Balara Bay. Additional snorkeling spots within minutes. The home has a large seaside terrace. The beach has a large Tiki Dome which provides shade and comfort. Very private. 1000 feet down a private drive off the Queen's Highway. Surrounded by tropical foliage. There are limited sand beaches on our leeward side of island. Our property is level and easy to walk, to stroll the gardens, to walk down Balara Bay. Excellent sea breeze on Balara Bay and the calm seas provided by Levy Island. We especially enjoy the vaulted Abaco pine ceilings of the front room and guest bedroom, the very private and extra-large master bedroom, and the small sun room for additional comfortable seating. Extensive windows and sliding glass doors allow water views in all rooms. toilet, combination tub/shower, En suite bathroom. Nice size. Ample storage. toilet, shower, En suite. Huge shower. Both bathrooms are pleasantly sized for comfort, convenience, and storage. Each bathroom has a window for seabreeze and for natural lighting. This is a beautiful stretch of beachfront property. In true island style, the beach conditions are constantly changing: sand, shells, seaweed, pebbles, varying tide levels and water clarity. Landline phone limited to local calls anywhere on island. Calling cards available for purchase in town for long distance calls. Air Conditioning in each bedroom for comfortable sleeping. Ceiling fans in each room throughout the home. Extra fans provided. All bed linens, pillows and blankets provided. Washing machine in the laundry shed on the west side of the home. Line for air-drying. Parking available in front of home. Bath, beach and kitchen towels provided. Wireless internet, bring your own laptop/device. Comfortable upholstered couch, loveseat, two chairs. The sunroom has additional seating. Provides space for quite reading or group conversation. Four burner gas stove with oven. Some available, check the cupboard before you shop. Plentiful dishes and utensils of all kinds. The kitchen features a breakfast bar. Microwave, small appliances including toaster, blender, beater, electric skillet, gf grill, crock pot, coffee maker, mixer, toaster oven. In addition to the breakfast bar, a small dining area is next to kitchen. 8 foot sliding glass doors provides beautiful view and good lighting to kitchen and dining area. No Cable. Bring your own entertainment - internet connection available for streaming (netflix, amazon prime, etc) check with your provider for international specifics. DVDs and player. Small assortment of DVDs available, bring your favorites. Small book selection in home. The historic Haynes Library in Governor's Harbour, well worth a visit. Croquet set and some board games available. Bring your favorites. Spacious gardens filled with tropical flowers and trees including Coconut Palms and Palmetto Palms. Kayaks and stand-up paddleboards available. Shared between two homes, plenty for fun for everyone! Huge seaside terrace with comfortable outdoor furniture including picnic table and loungers. Front entrance terrace overlooking gardens. Kayaks. Stand-up paddleboards. ADULT life preservers. Some snorkel gear available, bring your own snorkeling equipment for the best fit. Bedrooms A/C for comfortable sleeping; Ceiling fans throughout; TV in front room. Outside after-swim shower, picnic table, benches, sand chairs, loungers, private drive. Surrounded by tropical foliage; 80 feet from Caribbean Sea; beach. Safe and shallow water entry. Huge seaside terrace. Front terrace facing gardens. Balara Bay beach extends down to the old docks. OCEAN GOING KAYAKS. PADDLEBOARDS. LARGE TIKI DOME. ACTIVITIES WITHOUT EVER LEAVING OUR BEACH RIGHT IN FRONT OF THE HOME. Hummingbird cottage is remote and well appointed with everything you could need and more! Perfect for relaxing. We used the kayaks and paddle boards and loved playing bocce ball on the beach. Labels on everything are very helpful. We will definitely go back! Great! House was right on the beach and was stocked with everything. My husband and I with another couple stayed in Hummingbird cottage for 7 nights but we could have stayed much longer. It is very private with practically the entire cove to ourselves. Marion provides kayaks and paddle boards so you are able to enjoy the water whenever you want. And the cove is very calm. Just bring swim shoes since there are a lot of shells and coral that make walking into the water a little uncomfortable if you are bare footed. The sunset are nice to watch from the hut on the beach.The patio provides a place to have a drink and soak up the sun. The cottage itself is roomy with very cute decor. It is well stocked. And I mean really stocked. And very clean. Marion is next door if you need anything. She is an ideal host to help in any way. However, she is a busy women enjoying the island herself so we didn't see her a lot. She respected our space. If you are coming to Eleuthera for the privacy and to avoid the crowds then you are in the right place. Don't come if you are looking for resorts, entertainment or upscale dining. But you do have your local entertainment which is lot of fun. The Bahamians like to dance. They are fun and friendly people. There are places to eat which have fabulous food with a view as well. And the beaches. Well there are just to many to name, each one as beautiful as the next. Do your research before you go. Take advise from people who have been there. Some suggestions: Dining - Pascals (5 minutes from Hummingbird), The Wild Orchid in Rock Sound, Sunset beach bar (Good music too), Rainbow Bar and Grill, 1648 at French Leave resorts (pricey), and of course Tippy's on the Altantic side. Beaches: Lighthouse Beach (you must have an SUV but worth it), Twin Coves which is reachable by foot from Hummingbird, and of course the beach right there at the cottage. Misc: You must rent a car which can be arranged through Rhonda Rolle. Ask Marion! Be prepared to spend a lot of money at the grocery store since the food is expensive. Sometimes it was just less expensive to go out to dinner. negatives: There is a lot of trash along the roadsides due to the expense of getting garbage off the island but the cottage didn't have any trash around it and it was easy to get our trash to the curbside. Watch out for the noseeums. 1 out of 4 people react to them and it can make your vacation uncomfortable. Bring insect repellent with deet. One of our best rental properties. Marian was a fantastic host and the house was perfect in every way. Right on the beach, close to town and had everything we could possibly need. We loved every minute of our Eleutheran vacation. My husband and I just returned from a wonderful vacation where this charming stone beach cottage was our home for the week. The house was perfect for our vacation! It was extremely clean, airy, and bright with multiple sliding glass doors that looked out onto the water and private beach.The owner had thought of everything needed for our stay. No shortage of kitchen items and plenty of linens. The location was close to Governors Harbour and very private. We enjoyed spending time each day walking the beach and enjoying the tiki dome. Eleuthera was perfect for a quiet and relaxing vacation. We had a great time - thank you! The Hummingbird is a few minutes north of the island's largest settlement, Governor's Harbour. This center-island location provides convenient sightseeing/travel to northern and southern tips of our 110 mile long, two-mile wide island. Governor's Harbour Airport is ten minutes north. Taxi service at all airports. Car rental available. Eleuthera has easy access with direct flights daily from Atlanta (60 minutes), Fort Lauderdale and Miami (50 minutes) and Nassau (20 minutes). Picturesque Governor's Harbour has good restaurants, grocery stores, bakery, library, beverage stores, service stations, banks, gift shops, post office, and a movie theater. At the Hummingbird beach, you have access to: Snorkeling, Swimming, Shelling, Fishing, Kayaking, Beaching, Reading, Relaxing, Beachcombing, Sightseeing... What do you want to do today? Easy access to exploring Eleuthera's beaches and villages. Come enjoy the island hospitality, your home away from home. The base rate is for the first two guests. Each additional guest $20 per night. A $50 cleaning fee is required for less than a 7 night reservation. Christmas and New Year weeks have a $300 surcharge. NO REFUNDS INLESS YOUR TIME IS REBOOKED. $100 rebooking fee. Consult owner for availability. Stateside phone 330 920 4244. Island phone 242 332 2136. The Mockingbird #295571. The Hummingbird Stone Beach Cottage #103788. Owner approval required prior to adding more guests after initial booking agreement. Request rental agreement for further details. Prices are subject to change without notice. The owner is not responsible for shortages of recreational equipment or anything out of owner control such as temporary defects, shortages or stoppages in the supply of public utilities such as electricity, water, telephone or television services. Recreational equipment shared between two homes.